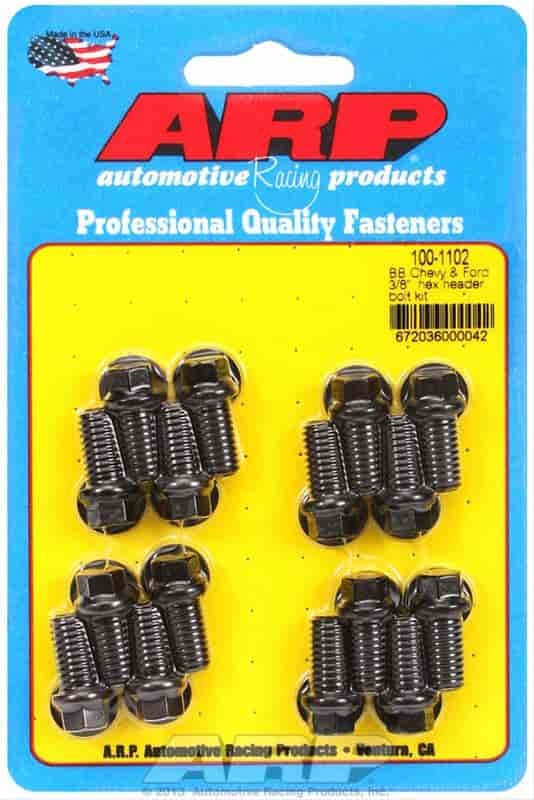 ARP's Exhaust Header Bolt Kits are specifically designed and engineered for attaching exhaust headers to a street or strip vehicle, without the worry of leaky gaskets or loosening during operation. These header bolt kits are premium grade, 170,000 psi tensile strength (stronger than grade 8) fasteners that are available in either 12-point or hex head styles. Stainless steel 300 or black oxide chrome moly finish delivers corrosion and extreme heat resistance, ideal for nearly any application. Each ARP header bolt kit includes the specific necessary bolt quantity for your application and premium-quality washers. Available for most GM, Ford, Chrysler and many universal applications. Does ARP 100-1102 fit your vehicle?